It just wouldn't be Christmas vacation without a stomach virus. Yesterday we were glad to have so many colorful buckets of goodies. They were easy to reuse for fluid control. 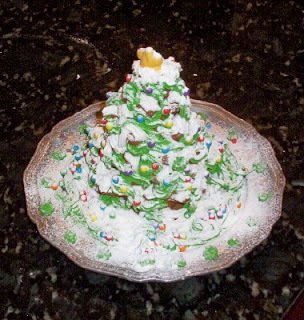 We still managed to ice our gingerbread cookie tree. One thrift store marked all Christmas items half-off, so I snagged the unused kit for $1. We're all about make-it-yourself here, but I figured we would get a dollar's worth of entertainment from it. That seems to be the litmus test for all my secondhand purchases. Will I get ___ dollars' worth from this item? I ask this question each and every time--whether it is for entertainment (a DVD to watch and resell), time-saving (the apple peeling gadget), health-promoting. Oh, no! I hope everyone is well soon!